The tallest residential building in the UK is set to be built after being given planning permission. 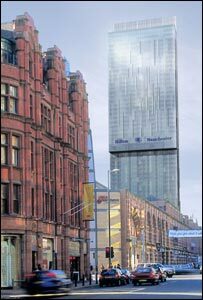 The 561ft (171m) tall, 47-storey glass tower is to be built at 301 Deansgate, in Manchester's city centre, and is expected to cost about £150m. Development on the Beetham Tower will begin next February. Designed by Ian Simpson Architects, the creators of Urbis and Number One Deansgate, the development will feature a striking, slender glass tower - with a 20m glass "blade". Manchester City Council has granted planning permission to North West developer Beetham Organisation to build the skyscraper at the crossroads of Deansgate, Great Bridgewater Street and Liverpool Road. Stephen Beetham, director of the Beetham Organisation said the scheme was one of the most prestigious in the UK. He added: "This is a project of major international significance for Manchester's continued development and will help push the city to the top of the European league." Councillor Tony Burns said: "I am delighted that this exciting project - a first for Manchester - is to go ahead." Already 206 of the 219 apartments and four of the 16 penthouses have been sold. Prices range from £100,000 to £3 million for a top-floor penthouse. There will also be a five-star Hilton hotel on the site and leisure and entertainment facilities. 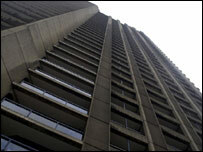 The tallest residential building in the UK is the Barbican in London, which is 420ft (128m). Manchester's tallest building is the CIS tower which when first built was the tallest skyscraper in Europe, standing at 387ft (118m).